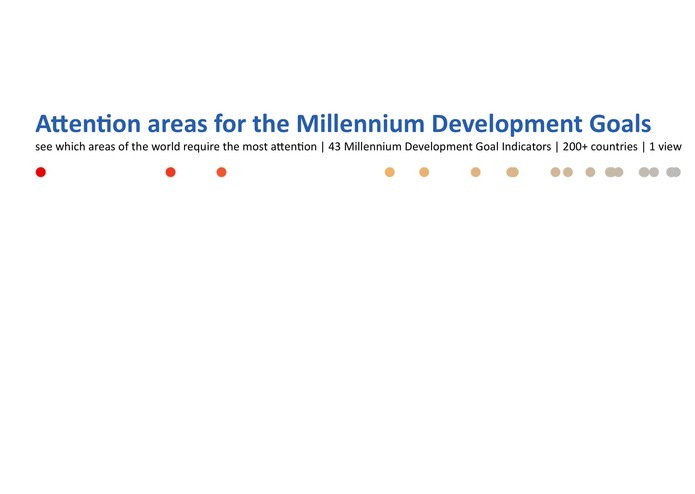 See which areas of the world require the most attention | 43 MDG Indicators | 200+ countries | 1 view See the latest status for each of the 43 Millennium Development Goal Indicators. 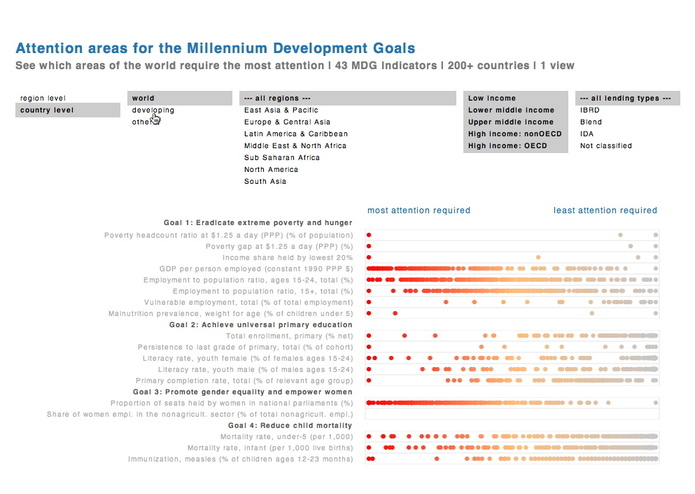 Per indicator is shown which areas require the most attention in comparison with the other areas. 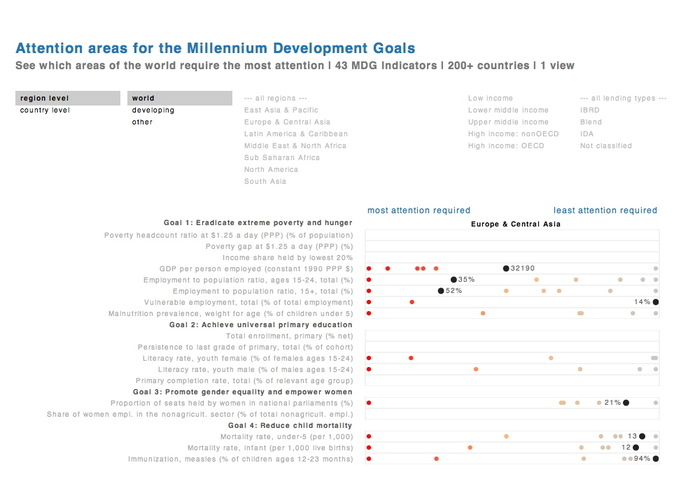 You can see the distribution of all areas (region or country level) for all 43 indicators in just one view! This will give you a color coded status report unseen before. See anything interesting in this report? Hover over a colored dot and see the name of the area and the corresponding value for the indicator. In fact for that particular area the position and values for all indicators are shown, thereby making it really easy to see how this area is doing on all indicators, also in comparison with the other areas; a status report for a certain area if you will. 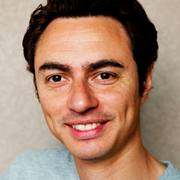 For further analysis you can use the selection tool to zoom in on areas categorized by region, income or lending type. Objectives One way of raising awareness is to show the world what the present state is of the Millennium Development Goals. 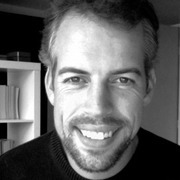 This application tells, for one thing, the story of areas that are deprived on multiple indicators. 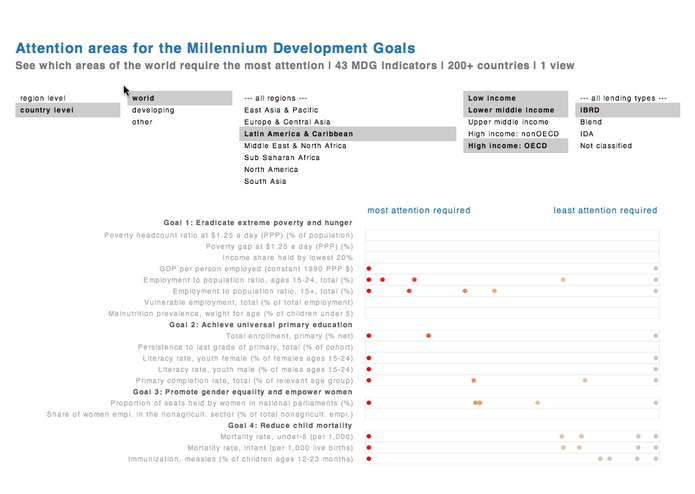 And also shows the world that per indicator there is a vast distribution of areas on the continuum of ‘most attention required’ to ‘least attention required'; not all developing countries have the same problems. This application will contribute to a more clear picture and tell a story upon which the international community, where possible, may allocate and speed up their already great efforts.